2. open the little door of the Firedome to slide a pizza on - which is better? In the earliest stage of this project, I simply assumed the temp in the dome, if we were to remove the dome, would drop so much the top of the pizza wouldn't cook adequately because the time to recover the heat would be too great. 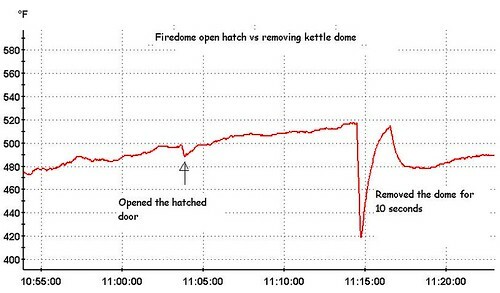 Pretty big drop in temperature removing the dome (opening the little door, 10°F drop, removing the lid, 100°F drop). I didn't try cooking on it during this expt., but I suspect if it takes too long for the temp to recover in the headspace, the food is in danger of overcooking on the bottom before the top gets cooked. 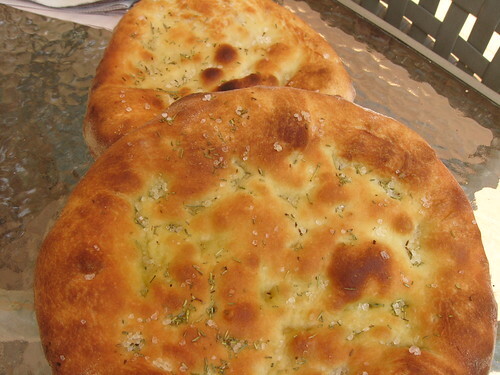 After the expt, while the grill was hot ... a little focaccia for lunch and dinner. What if you cut a hole for sliding the pizza in but didn't reattach the cut piece as a door. I'm thinking a much smaller vertical cut (the width would obviously be the same, but the height would be reduced dramatically, just enough to get the peel and pizza out-3 inches ought to be plenty). the only reason I ask is I'm lazy! Totally would work (my guess). In fact, i think if you could find about 4 x 2-3" spacer kind of things to suspend the lid above the cooking surface - keeping the dome intact - the heat could probably be ratained enough to pull off the cooking. Or, some kind of hood of car type prop opening of the dome a few inches too would likely keep enough heat in for a near constant temp in the headspace. I think there's probably a bunch of neat work arounds.